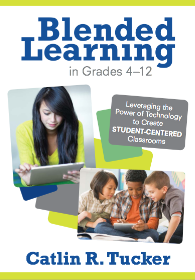 When I left credential school 16 years ago, I had very specific ideas about teaching and learning. Some of these preconceived notions were based on my own experience as a student then reinforced in credential school. Students should sit in rows. A quiet classroom is an effective classroom. Students in the same class should do the same assignments. It’s only fair. Students demonstrate understanding with a pen and paper. The teacher possesses the information. As I review this list, I am struck by the difference between this initial vision and my classroom today. The truth is I’ve had to unlearn most of what I was taught about teaching. 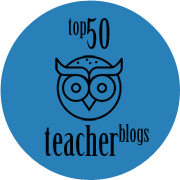 I believe these initial assumptions about teaching almost led me to flee this profession. 1. 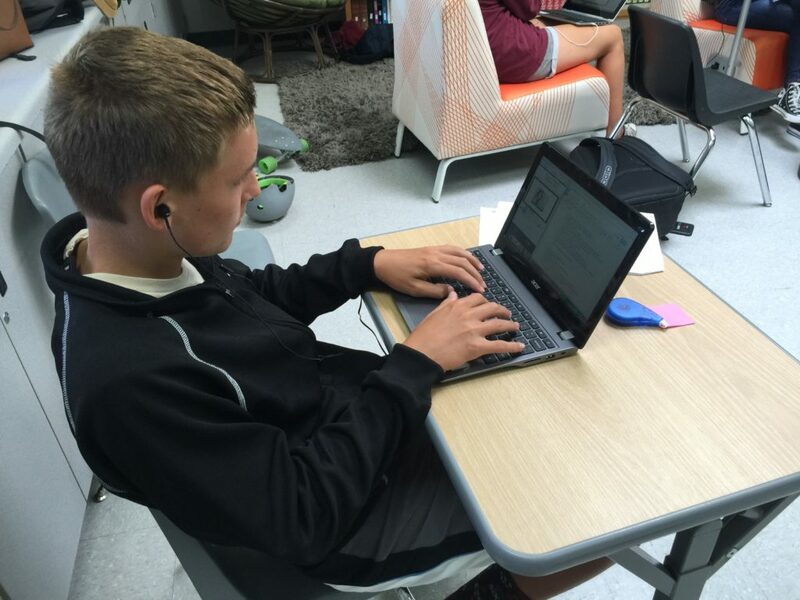 Students create their own learning environment daily. 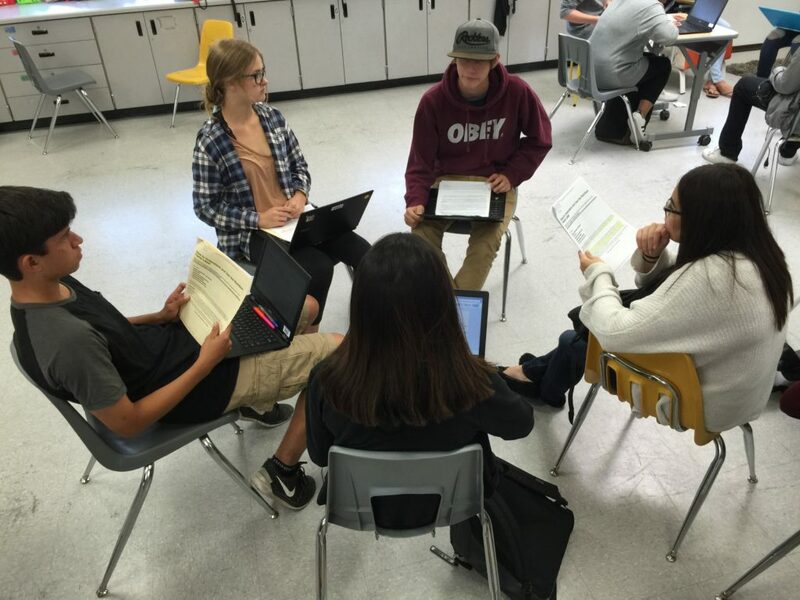 As my very talented co-teacher, Marika Neto, put it, “The first step in creating is creating your learning environment.” We don’t have seating charts and students are constantly moving around to ensure their space enhances their work, whether it is individual or collaborative. 2. My classroom is anything but quiet! It is a buzzing hub of conversation, collaboration, and creativity. I marvel at how much learning happens on the edge of what I would have described as “chaos” early in my teaching career. Now, I can appreciate the value of their interactions and conversations. If we put 30 kids together in a room for 90 minutes they should be able to talk to one another, work together, and learn from the collective intelligence around them. 3. The idea that every student in a classroom should be required to complete the exact same assignment strikes me as the opposite of fair now. Students are at wildly different places in their learning. Their assignments should be customized to appeal to their interests and meet them where they are at in terms of skill level. The days of the one-size-fits-all assignment are long gone in my classroom. 4. When asked how many of my students regularly use pen and paper outside of class for tasks not related to school, most report “rarely.” So, it’s my job to give them other ways to show me what they know. 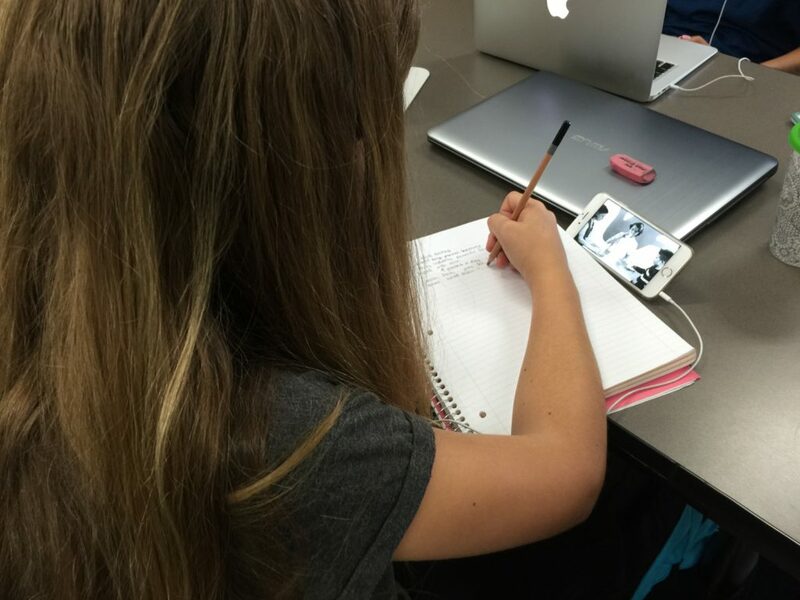 Students record videos and audio clips, take pictures, design infographics, publish digital notebooks and build online portfolios. It’s amazing how creative students can be when they are given the opportunity to decide how they want to demonstrate their learning. Giving them that choice is powerful. Unlearning everything I was taught about teaching is the best thing that could have happened. Everything I unlearned helped me to appreciate how resourceful, creative, curious and capable my students are! What have you had to unlearn? How has it changed the way you teach and your students learn? But wait!!! You’re creating a college-level environment!!! How can mere ‘kids’ learn that way??? That’s a great report. Going back to the origin of the word ‘educate’: to draw out. Perhaps, in time, teachers won’t have to unlearn what they’ve been taught. Have you done any follow-ups to see how your graduates are doing further along the track? Do you think there’s an optimum classroom size? (Other than 1:1, of course.) Is there a reasonable upper limit? Have you ever had to deal with an unruly student? I hear back from students all of the time about how the work we’ve done in here has helped them be successful, but most of it is anecdotal. In fact, I just got a wonderful email from a student who is graduating college, so it’s been 7 years since she was in my class, and she wrote about how our class helped her in college. In terms of class size, I’d always say a smaller teacher to student ratio is best. I’d love classes of 20-24. To be honest, I don’t have unruly students. The more we give students autonomy, challenge them to be creative, and engage them with interesting activities, the less we deal with unruly students. There’s so much in this post to like. Allowing students to create their own learning spaces is something I’d like to figure out a little more in my own classroom. I’m surprised that a teacher education institution actually taught you these things in 2000 – a note to it would not go astray. Wonderful. I completely agree with u. Experience the same thing. Where do you teach? Can we go study there? Looks amazing! The way you teach is one of the main reasons I home-school, meaning, if school was like that, I’d send my kids to school. role is that of a navigator, who provides the central theme. Generates questions and seeks questions from students. Hi Catlin, I teacher Adult VocEd. I love exploring new and interesting ways to engage my students. As i read articles like this and many others i can not relate them to my classroom. This frustrates me. Am I trying to put the proverbial square peg in the round hole? 1. The company i work for is paid a set amount to train adults to perform certain tasks to a minimum standard so they can be certified in a predefined timeframe. I struggle to adequately deliver the required information, demonstrate the skills and given them the opportunity to practice what they have seen. Letting every cohort of students create their own learning environment is beyond my comprehension. I cannot even begin to think who i would even suggest this sort of approach to my head teacher. 2. 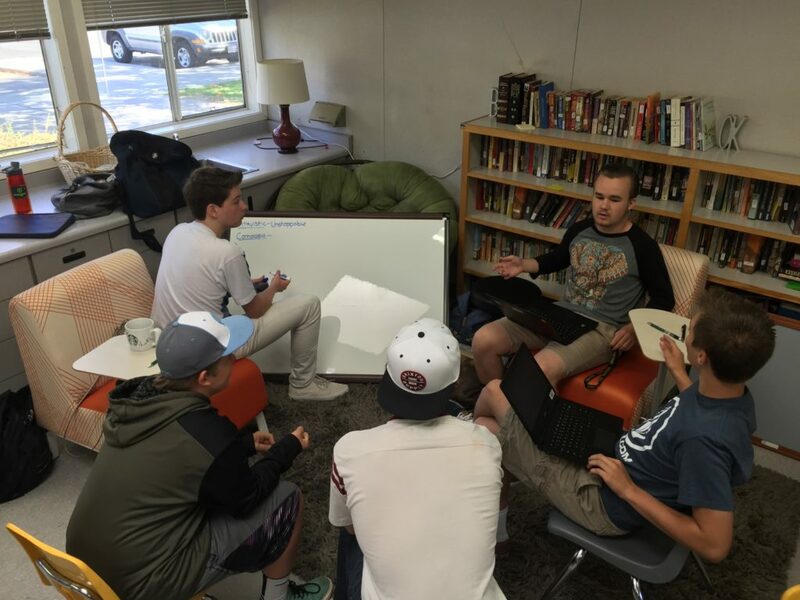 If i gave my students a topic to research and learn in a small group in their own new learning environment, i can only imagine the time that would be wasted and the frustration i would experience trying to keep them on task. How does this achieve the desired learning outcomes when groups can (and maybe are encouraged to) go off on tangents? 3. I have to give standardised assessments that are produced to cover the mandatory knowledge and skills for national competencies. I acknowledge that everyone is an individual but i have to create an auditable trail of evidence that each student can perform the minimum skills for national certification. This all has to be done within the time frame allowed. 4. How do you find marking videos and audio clips, pictures, infographics, digital notebooks and online portfolios against a standardised criteria? It sounds like a nightmare. But then again marking a hundred identical exam papers is not my idea of riveting reading either. 5. This last point i have no problem with. I often can learn something everyday from students who come a wide array of professions and backgrounds. I feel like i have too many constraints to make much use of your suggestions. Despite my earnest desire to provide a better learning environment for my students. Or maybe i am too stayed and programmed to undo the learning i have? Any suggestions for how an old work horse can learn new tricks? 1. 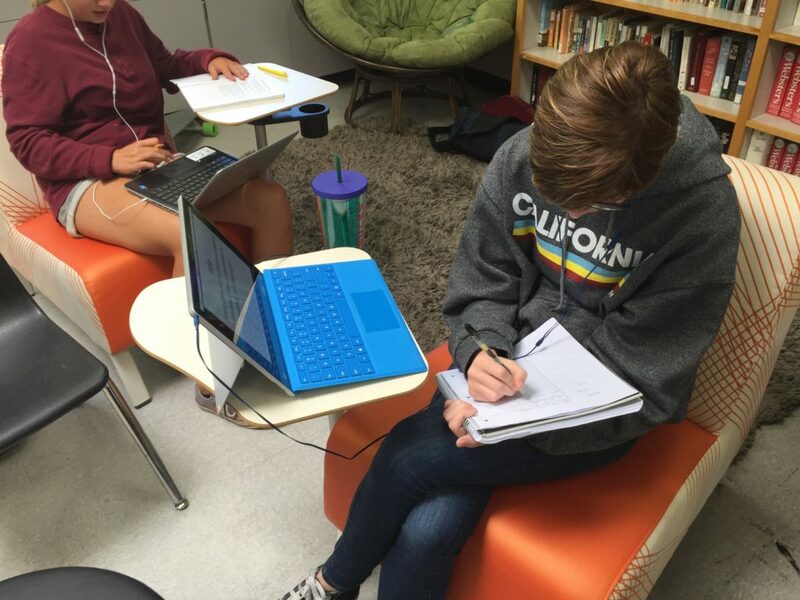 A student-created learning environment can be as simple as allowing students to move furniture around to best meet their needs as learners instead of assigning seats and making it clear they are not to move the furniture. 2. 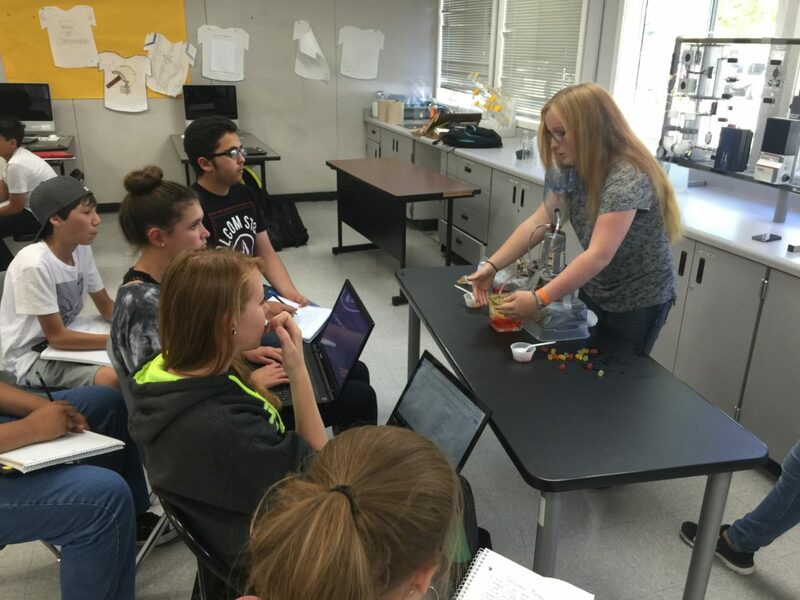 When students own the learning in a classroom, they must have some control over the pace of that learning. They will need time to investigate and problem solve. Of course, there are times when they go off on tangents, but I don’t see that as an obstacle to learning. We are social animals and they learn so many valuable life skills as they navigate tasks together. 3. Time constraints are a challenge for every teacher. I’ve decided to make time for a new assessment strategy. Again, this shift has been so incredibly rewarding that it feels well worth the time investment. 4. I find it much more interesting to assess creative work as opposed to grading the same assignment 90 times. I also use technology to make my workflow more efficient, like leaving voice comments. 5. Lastly, I always think there’s more to learn which is why I LOVE teaching. I think the best teachers are the best learners. I hope to keep learning, experimenting and iterating. I believe any teacher can embrace new strategies and approaches! Your classroom represents the image of teaching and learning we support in our teacher education programs at Washington State University. And when preservice teachers come to teacher education from classrooms like yours, Catlin, then they don’t have to unlearn teaching practices (developed from an “apprenticeship of observation” across years as a student). Our work in teacher education is to help them develop an understanding about why their teachers worked so hard to create these student-centered spaces and how they can nurture each student’s creativity and growth. It’s exciting to hear that type of shift is happening in credential programs, Tamara. It’s much easier to start that way instead of trying to shift after years of teaching in a teacher-centered model. I would LOVE to see your classroom in action! Your right that every classroom and every teacher is unique. But I wonder just what you “teach.” People sitting around talking is not necessary “creative” or even deeply engaging. And there is much that not only young students but old adults need to learn, especially in an increasingly fragmented and unsustainable society. 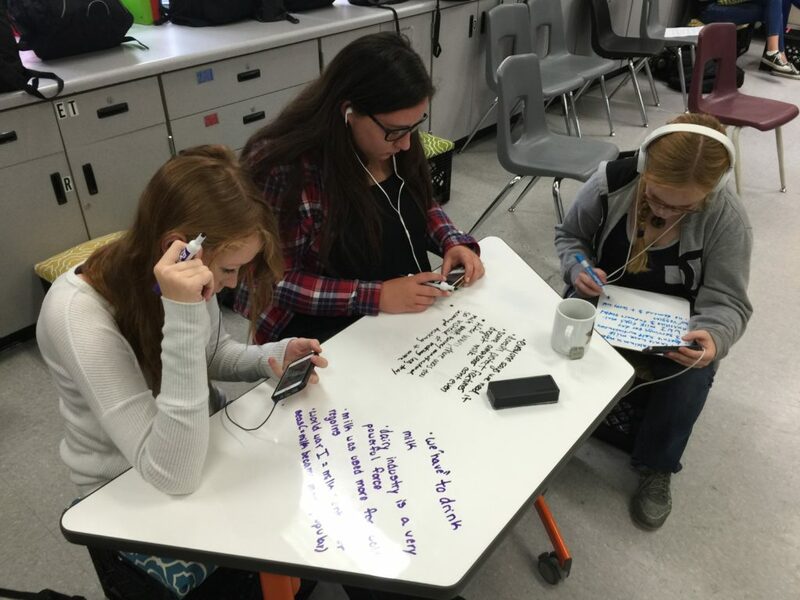 My classroom involves a lot more than “sitting around talking” but conversation and collaboration are central to my classroom design. I use station rotation to individualize instruction and flipped classroom to allow students to self-pace their learning when digesting new information. I am definitely providing instruction, but I also prioritize students learning how to learn without a teacher talking at them for the majority of the period. I also think my job is to design learning experiences for them, which is a key part of teaching. 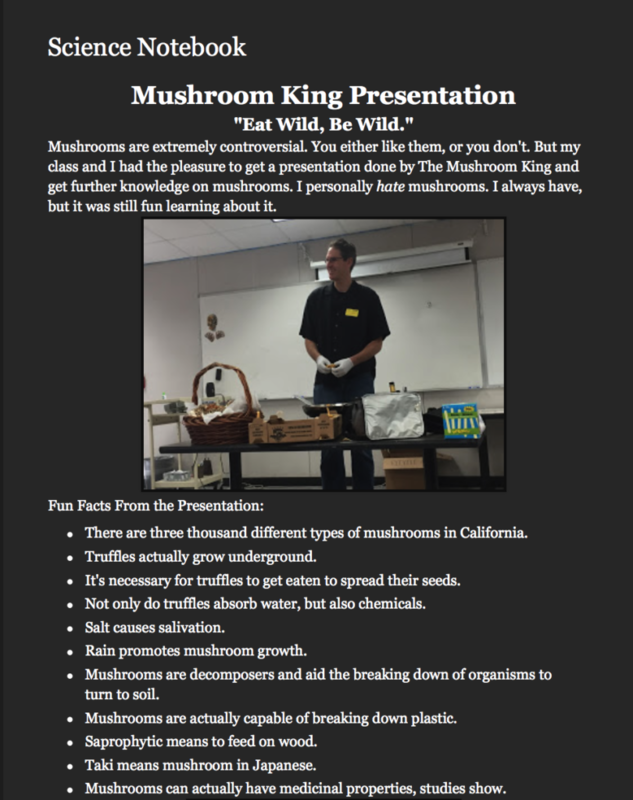 Awesome stuff – I can relate and I enjoy teaching in this manner as well. 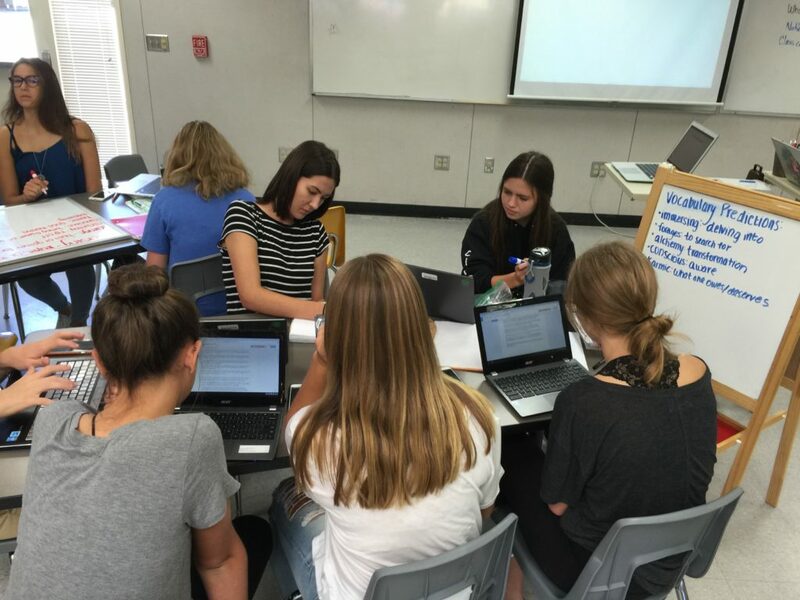 I really love this – it was so great to hear from a teacher who is actually implementing the idea of student-led learning that others think and talk about, but don’t know how to get started. The feedback may be anecdotal at this point, but I am confident from my own observations and conversations with students that this is the best way to teach, one that respects individual differences and supports all students. Education is not – and never was – “one size fits all”. Question for you about the different assignments. First of all, I love this idea. What do you do with things like papers, though? We do several papers throughout the year, and sometimes I wish I could give them more choices, but I am afraid that if they don’t write the different types of papers such as the literary analysis essay or research paper then they won’t know how to do it in college. Also, we have a curriculum map that can be tweaked but we are in PLCs and our principal expects us to go by what our curriculum map says. Any suggestions for this? I don’t think students have to write different types of papers, but I do give them a lot of freedom to focus on topics that appeal to them. For example, my students are currently writing a psychoanalysis of a character in Romeo and Juliet for our mental health unit. They get to choose the character and the mental health condition they want to focus on for the essay. When we do research papers, they might have a big umbrella idea they have to focus on, like sustainability, but they get to choose the focus of their paper. They can research issues related to environmental or social sustainability. I think the key is building choice into the prompts we write. I agree that kids should practice writing many different types of essays. I am in the planning stages for our R&J unit with sophomores and I am intriqued with teh idea of apsychoanalysis of a character…would you be willing to share more about this? Here’s the prompt we used. Nice article. Can you share more about your mental health unit? Also what are your other units and how has this personalized approach impacted your curriculum unit design? The students help to craft the driving questions that guide our investigations into these topics. The units integrate English, science, and technology so all of their readings, labs, projects, etc. were focused on these big topics to help them better understand them. 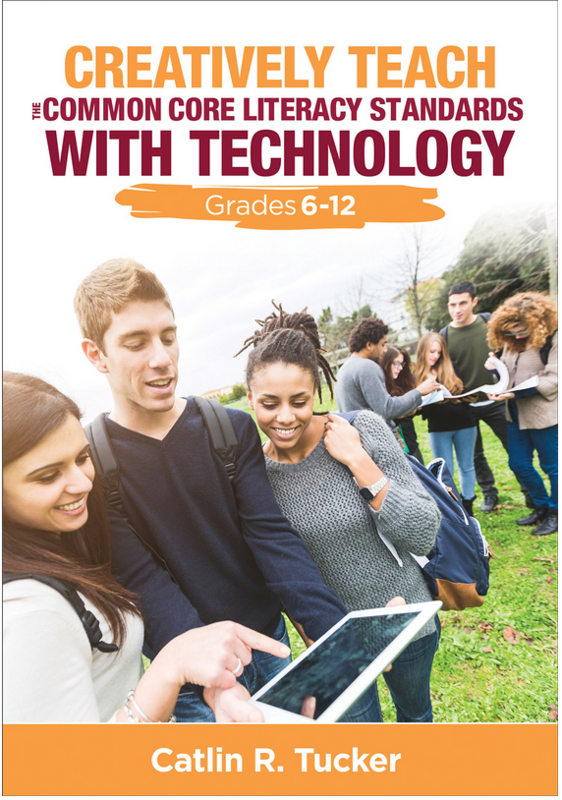 When it comes to personalization, I am focused on trying to use technology (online resources and adaptive software) to support individual students in developing their individual skill sets. I have a really diverse population with a range of needs. I also use Station Rotation to allow me an opportunity to work with small groups of students so I can tailor my instruction, modeling, scaffolds, etc. for kids at different levels. In terms of big projects, I allow students autonomy to make key decisions about what they plan to work on so that the projects are specific to their interests. Personalization is an ongoing challenge with so many kids, but I feel like I’m getting closer to meeting their individual needs. I love your work and articles…I’m learning a lot! I am a 5/6 elementary teacher and am thinking about starting something similar to you grading alternative described in a previous post. Because I teach all subjects I’m struggling with where to start because I feel taking on that approach in all subjects at once might be overwhelming. Do you know of anyone doing this in the younger grades? 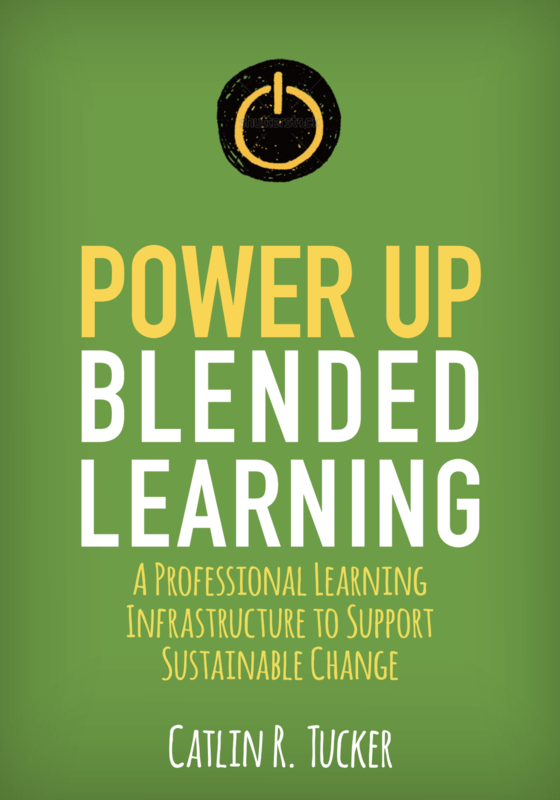 I’m currently a blended learning coach on my non-teaching days working with elementary teachers in the district north of mine. Many begin some of these shifts by using the Station Rotation Model. In fact, I designed a model lesson for a 5th grade two weeks ago focused on student-centered practice with math concepts. Here is the slide deck I designed that has information about the stations. It might make this conversation more concrete, especially since it’s your grade level. I’d say start with ELA or math and play around with designing a few stations for students to move through. Focus on making them collaborative, hands-on and fun! I love this innovative shift in pedagogy. I can see this working with older students but what is your opinion about a rambunctious class of ninth graders? How can I take their energy and “squirellism”, which I love, and channel it into this kind of a learning environment, supervising and keeping them on track while working with others in small groups? 1) Group strategically: I try to blend my squirrely kids with my more focused leaders, so they have peers pull them back into the task at hand. 2) Ask for a deliverable: Even if a group is working on a long-term project, I require formal updates or tangible deliverables. I want them to know that I am checking their progress and they are responsible for making progress, which does help to keep them more on task. 3) Build in time for self-assessment and peer-assessment: I am constantly asking my students to assess themselves and their peers. I want them to be reflecting on their progress, development of specific skills, and participation in group work/tasks. Truth be told, I’m also a pretty tough teacher. I call my kids out if they are off task or distracting from the learning. Most of my students would rather not have a 1:1 conversation with me about their behavior, so I don’t deal with too many management issues. I will say that having some flexible furniture options has helped my kids who need to move to learn. I agree 1000% with every single word you wrote. Thank you, I’m feeling less …lonely! I will read your books and will hopefully be able to teach this way when I’m back in France (will people around me accept such an approach? The challengedoesn’t so much reside in “how the students react”, but in how the other teachers and the admins do!). Thank you for the example you set. It’s so much more respectful of the students than everything I have known! 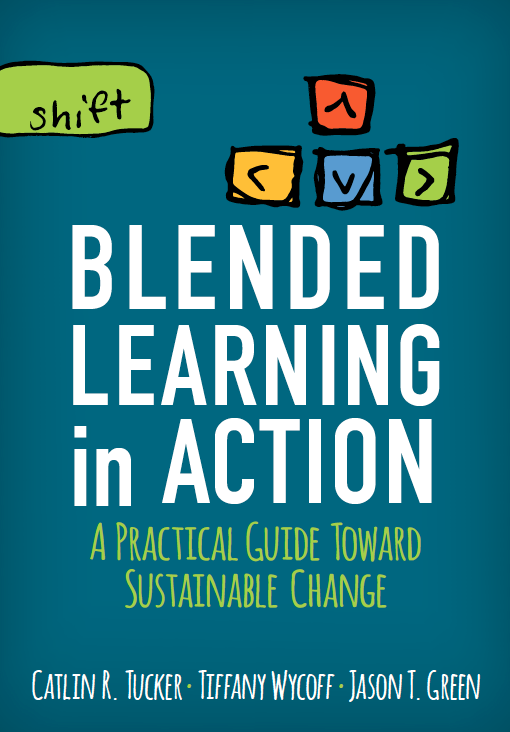 I also agree that the challenge is less convincing students that things need to change and more about getting other stakeholders, like admin and parents, onboard. I read a fascinating quote by Peter Senge in which he said that parents are the number one reinforcers of the status quo. They expect their kids to learn how they learned. It’s important to explain the WHY behind what we are doing to parents so they see the value.